About half-way through the period of Egyptian captivity, God provides a glimpse of the attitude of the Israelites regarding the Dominion Mandate. 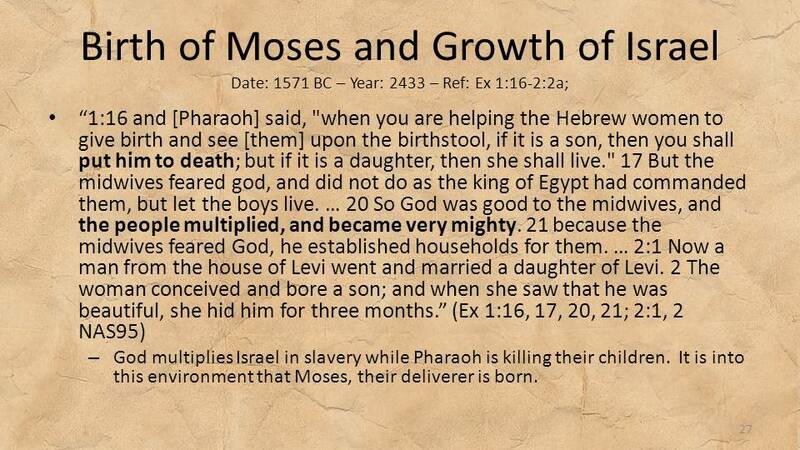 In the midst of Pharaoh’s threats to kill all boys born to Hebrew households, God’s people still continued to be fruitful and God preserved the growing Israelite people. The Hebrew midwives refused to obey Pharaoh’s evil command. As a direct result of their fear of the Lord, God established households for them. Pharaoh eventually relented and released the Israelites 215 years after Jacob’s family sojourned into Egypt to survive during the years of famine. It is Israel’s faithfulness to God’s command "be fruitful and multiply" that directly leads to their release. Today, I will begin a series of blog posts on the Biblical command to “be fruitful and multiply.” I will trace this thread throughout 3,600 years of Old Testament Biblical history, beginning with Genesis 1 right through the Malachi 4. I will show the verse, with a brief heading and date, and offer a view brief comments. These two facets are related. The earth cannot be subdued unless it is populated. Subduing does not refer to any one particular point in history, but rather an ongoing stewardship throughout all of history. This command is given to God’s people.